The Hawaiʻi Department of Agriculture has issued the first licenses to growers under the State’s Industrial Hemp Pilot Program. 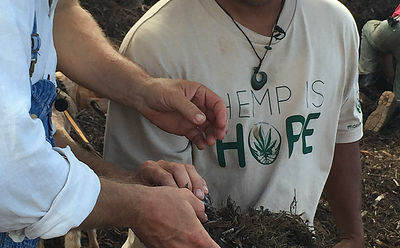 During the month of June 2018, industrial hemp licenses were issued to one grower on Kauaʻi and two on Hawaiʻi Island. Governor David Ige said the program will help to demonstrate the real potential of the industrial hemp industry. Agricultural Board Chair Scott Enright said the program aims to monitor and assess the best methods of cultivation in Hawaiʻi’s growing conditions. Industrial hemp and marijuana are both members of the same plant species, Cannabis sativa L. However, industrial hemp refers to cannabis plants with a THC (tetrahydrocannabinol) concentration at or below 0.3%, which is about 33% lower than the least potent marijuana. Although industrial hemp and marijuana may look the same, it is not possible to get a chemical high from industrial hemp. Some of the challenges that HDOA in establishing the program included the importation of hemp seed which is considered by the federal government as a Schedule 1 Drug, which is highly regulated especially when transporting within and into the US HDOA worked with federal and state drug enforcement agencies to successfully import the hemp seed varietal, Yuma, from China which will be used by the licensed growers. Based upon its own research and tests in Malawi and Australia, HDOA believes that the Yuma varietal is suitable to grow in Hawaiʻi’s climate.